The universal holder can be used with a variety of phones, not just the iPhone X. It also features a standard tripod socket, so it can be used with most tripods and monopods, not just the one included in the kit. 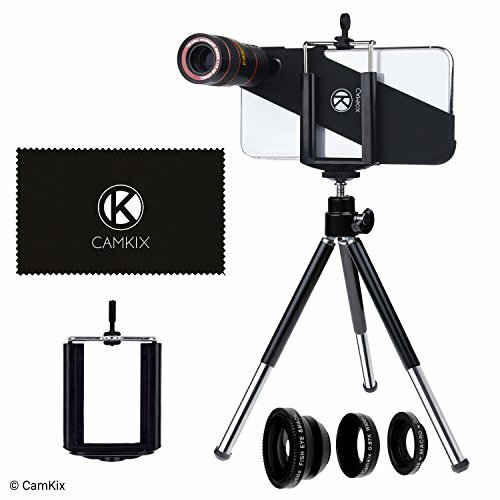 ✅ FOUR GREAT LENSES IN ONE KIT ►Awesome mobile photography for Apple iPhone X. Includes 4 lenses: 8x zoom telephoto lens with manual focus ring, fisheye lens, macro lens and wide angle lens. All lenses are made from aluminum for increased durability. Combine with your favorite apps to share photos instantly! ✅ ENHANCED PHOTOGRAPHY + VIDEO ►8x Telephoto: Get a clear shot of subjects usually too far away to capture. Fisheye: This lens will give your images a round, fish bowl effect. Macro: Capture amazing close-ups in crisp detail. Wide Angle: Allows you to capture larger scenes. For example, long cityscapes and large group shots. ✅ WIDE ANGLE AND MACRO LENSES IN A 2-IN-1 SET ►These two small lenses are screwed together for easy storage. To use the wide angle, simply attach both lenses to the case provided. To use the macro lens, simply unscrew the wide angle lens. ✅ UNIVERSAL PHONE HOLDER CAN BE USED WITH MULTIPLE DEVICES AND MOUNTS ►The universal holder can be used with a variety of phones, not just the iPhone X. It also features a standard tripod socket, so it can be used with most tripods and monopods, not just the one included in the kit. If you have any questions about this product by CamKix, contact us by completing and submitting the form below. If you are looking for a specif part number, please include it with your message.